Police will be out in force across Kent and Sussex on Monday monitoring the annual London to Hastings bike run. 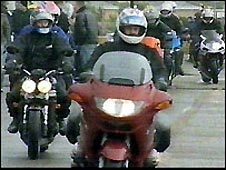 More than 20,000 motorcyclists are due to ride to the East Sussex resort, with many using one of the longest stretches of road in Kent, the A21. The May Bank Holiday event dates back to the 1960s, but poor weather has limited numbers for the last two years. Sgt Kevin Williams said: "We want riders to enjoy riding on our roads but we want them to do it safely." "We then want them to go home to their families in one piece at the end of the day. "We also want other road users to be able to go about their business safely so we won't tolerate anti-social riding that threatens and intimidates others," he said. The bike run claims to be one of the UK's largest non-organised events, with riders known to attend from across Europe as well as further afield. Sussex Police will be patrolling all the major routes into Hastings with support from Kent Police and the South East Coast Ambulance Service. It has warned motorcyclists to pay extra attention to their riding, and for car drivers to watch out for bikes and not to block their progress.